I am ahead of my time–at least in the moment. I say this because this post is basically about the turkey, and Thanksgiving is almost eight months away. However, inspiration for this post came from a fascinating talk on “The Life of the Mimbres Turkey.” The speaker for Southwest Seminars on April 1 was Sean Gregory Dolan, Ph.D. He is an archaeologist at Los Alamos National Laboratory who serves in the area of Environmental Compliance and Protection. Dolan humorously announced that the Mimbres turkey is currently a “hot topic.” The Mimbres people, who congregated in southwest New Mexico, may have begun to domesticate the wild turkey between 200 BC and AD 500. 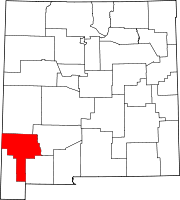 Dolan’s research is focused on Elk Ridge in the northern part of the the Mimbres Valley. This site once encompassed over 200 rooms. “It has more turkey bones than anywhere,” Dolan said, but this is not a lot. His goal is to determine, through the study of turkey bones, where the birds originated in North America (there are six different subspecies) and to what degree they were domesticated and even consumed. It seems at the moment that their primary value was in the feathers that were used in decoration and ritual. The bones were made into things like awls and needles. Because so few bones have survived, archaeologists know of the turkeys’ presence primarily through art. 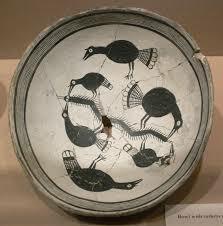 During the Mimbres “Classic Phase” from about AD 1000 to 1030, the turkey was amply recorded in distinctive, black-on-white pottery. In the bowl at the right, the turkeys are eating a centipede. 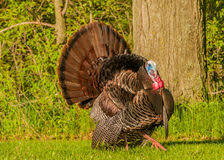 Wild turkeys eat a wide variety of foods, including roots, nuts, berries, flowers, insects, and even reptiles. 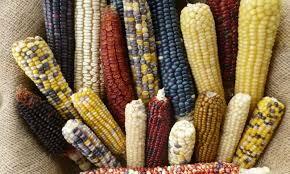 However, what probably drew them to the Mimbres people was the maize they planted on floodplains. At some point, perhaps the Mimbres took some eggs and hatched them (the female turkey can lay from nine to 13), and the hatchlings imprinted on the people and remained in the community. As I said, it isn’t known yet to what extent the turkeys were actually eaten, and the scientists are studying DNA and carbon vs. nitrogen isotopes to ascertain where they came from and whether individuals were wild or domesticated. Dolan shared some very interesting detail about turkey anatomy. We think of them as pretty grounded, but wild turkeys actually fly well, up to about 50 miles per hour, and they can run very fast. The males, both wild and domesticated, are about twice as big as the females. The male has especially interesting features. His head is covered with warty-looking flesh called caruncles that turn a brilliant blue when he is aroused. The fleshy appendage extending over the beak is called a snood, It turns bright red to attract attention and can grow as long as five inches. The wattles hanging from the neck also become engorged and bright red during courtship. On the bird at the left, you will also see a feathery dangle on the breast called a beard, which can stand up in arousal display. Of course, the most telling display is when the male bird poofs out all his feathers and “struts” around. This is possible at any time of year but is especially common during spring mating season. The seduced female crouches down to signal her readiness to copulate. Generally, when Southwest archaeologists find evidence of drought, it corresponds with deleterious social transformations–violence, famine, disease, and depopulation. Yet this was not the case in the Mimbres region. Thus, the Mimbres Transitional phase provides an intriguing comparative case study, in which people were able to adapt, survive, and even thrive during declining environmental conditions, changing the way they built their houses, made and traded pottery, gathered as a community, and thought about their world. Nevertheless, when Chaco Canyon fell in AD 1150, which I wrote about in an earlier post, so did the Mimbres. Where they all went, we do not know. And there is more about the turkey that Sean Dolan did not touch on, and now the story goes personal. Several years ago, I walked with a friend in the yard where she was raising both chickens and a turkey for Thanksgiving. As the turkey moved around, suddenly our eyes locked. It was an arresting moment. “I am more than you know,” is what came to mind as the eyes’ message. I turned to the writings of naturalist and mystic Ted Andrews with regard to this matter. He said that the snood dangling down the male’s beak originates in a space between and above the eyes that is linked to the ancient, metaphysical idea of the third eye. Known as the source of intuition and “the center for higher vision,” it is also considered “the seat of the feminine energies within each of us” that are tied to Mother Earth. Maybe I should send my blog to Dr. Dolan to supplement his perspective. Nah. I don’t think so. And P.S. I should clarify that the quote by Black Elk that I shared in my last blog did not relate specifically to the Hundredth Monkey Phenomenon. He died in 1950, decades before the idea was being discussed. 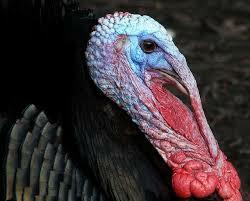 Wild turkeys are fascinating and you covered some of the interesting facts about these creatures. We used to have these birds in our area but as it has become so populated with more & more concrete they have either died off or moved to safer habitats (that are few & far between). Ellen, your topics are so fascinating and tied in so beautifully to your wonderful state. Thank you. Check the box below before submitting your comment.